Right need a bit of urgent help , first problem is I’ve just put forks back together after changing the seals , left fork with the spring in is fine but the right fork with the damper seems to push down really easily and takes ages to come back up?? Next problem is the front spindle is really hard to get back in it goes through the wheel ok but after that it’s mega tight to thread in feels like I’m forcing something? Fork leg pinch bolts are wound right off, help please!? I’m thinking the right leg is the rebound one. It’s only controlled on the rebound hence it compresses easy. They feel very different to each other. Not like normal forks that do both jobs. Spindle will go through. I put my foot under the wheel to hold it level and you then jiggle the spindle in. Don’t panic. Breathe. Don’t get a hammer! It’s not needed. It goes in from the throttle side of the bike!!! Thanks for that pindie !what I mean is Ivan get the spindle through the wheel and in to the opposite fork leg but then it gets very tight towards the end of the thread I can’t physically turn it any more and I’ve got about 35mm of the spindle still sticking out of the fork leg , the only thing I can think is that my spindle is bent but it looks fine ? This is as far as I can get it in before it goes tight , any ideas anyone? I’m guessing it all came apart ok? Are the threads clean, spindle and fork lower? None damaged? All in line? Try cleaning out with a toothbrush and brake cleaner. Inspect closely. Then try again. If that works great. If not check exactly what you are doing. Smear grease on threads and any clamping surface when doing final install. Try putting the spindle through without the wheel to make sure the legs all line up correctly. Also you say the spindle threaded in from the "other way". 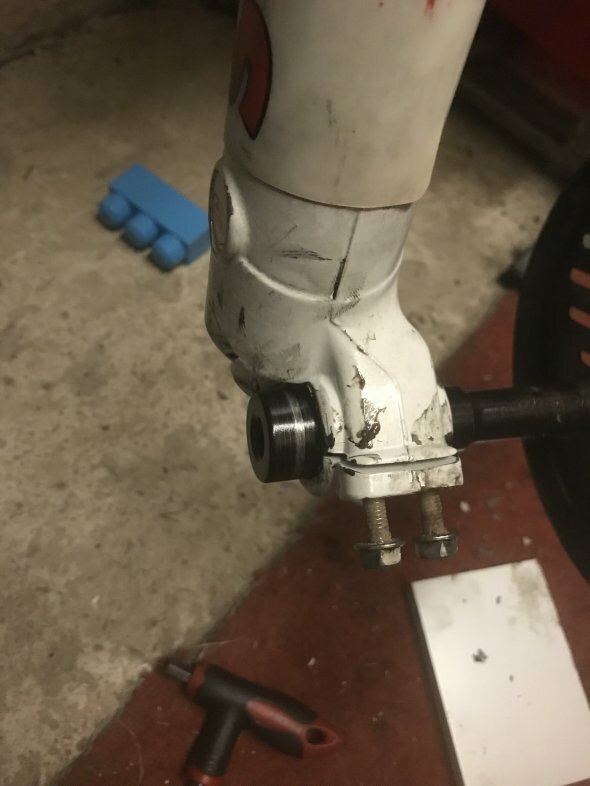 Try putting it into the brake side fork leg and screwing it in there as it could have a damaged thread on that side where the spindle first contacts. You haven’t dropped the spindle on it’s end and collapsed the first bit of thread have you? Have you tried the screwing the spindle in to just the threaded fork leg on its own? Sounds to me like the threads are damaged or as pindie suggests deformed due to being knocked. If this is the case then it will need tapping out using a tap and die set or in the past I've used a high tensile bolt with the same pitch thread that I've ground a taper on the end (start of the thread) and slowly persuaded it through with plenty of oil! Good stuff. Glad you are sorted.